This is exactly what the title says – a graphic novel version of Jane Eyre. It’s part of a series of graphic novels aimed at helping teens enjoy classics through a different media. There are several versions of the GN – a quick text and one that uses the original text. I read the latter. I love Jane Eyre. It’s one of my favorite books. Unfortunately, while this version stuck to the plot, it just couldn’t convey everything that was in the original novel. I didn’t expect it to, of course. Just like I don’t expect a movie to convey the entire thing. This did as well as could be expected, but at the end, mostly I just wanted to delve into the real book again. 🙂 It was a great reading experience, though. And fun to know that pretty much no matter what form I read or see Jane Eyre in, I will enjoy it and get completely engrossed by the end. 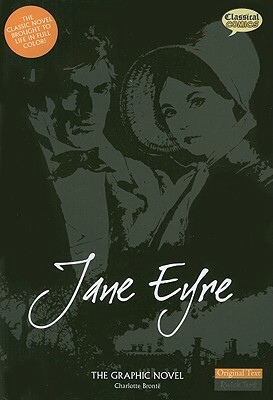 What I really need to read now is my copy of Jane Eyre illustrated by Dame Darcy. I got it for Christmas last year and have yet to read it. It’s so pretty…I really need to get to it soon! This entry was posted in 2009, Adult, Visual and tagged classics, reread, RIP-worthy. Bookmark the permalink.